Image caption Hashim Thaci said the election was a vote for "good governance"
Kosovo Prime Minister Hashim Thaci has claimed victory in the country's first parliamentary vote since declaring unilateral independence from Serbia. 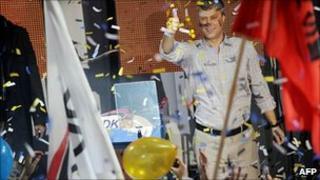 He addressed supporters hours after an exit poll gave Mr Thaci's Democratic Party of Kosovo (PDK) 31% of the vote. Its main rival and ex-junior coalition partner, the Democratic League of Kosovo (LDK), was second with 25%. If the results are confirmed, Mr Thaci will need support from other parties to form a government. The newcomer Self-Determination Party, led by student activist-turned-politician Albin Kurti, was in third place with 16%. In a speech broadcast on Kosovo state TV, Mr Thaci said his party had won a "major victory" for "democratic and Euro-Atlantic values". "Today, the will of Kosovo citizens spoke and decided clearly, today European Kosovo spoke, today Euro-Atlantic Kosovo spoke." The Central Election Commission said the overall turnout was 48%, according to the AFP news agency, compared to 40% at the last elections in 2007. The commission's head, Valdete Daka, said the voting process had been a success. "There have been technical hitches that have not hurt the process," she said. The ethnic Albanian majority and small Serb minority remain largely estranged in Kosovo, more than a decade after a Nato-led conflict broke Serbia's control. Belgrade has not recognised Kosovo's independence and most Serbs were expected to boycott the elections. The EU says the election is important for Kosovo's hopes of entry into the organisation. During the campaign, institutionalised corruption and the dire state of Kosovo's economy consistently topped lists of voter concerns. Pre-election opinion polls had suggested the PDK would win without an outright majority, with the LDK mounting a strong challenge. Polls closed at 1900 (1800 GMT) on Sunday. Police reported a handful of minor security incidents. Shots were fired at an empty building used by Nato peacekeepers in the Serb-majority town of Zubin Potok. Because of the expected Serb boycott, the election commission set up mobile polling stations in the north. However, turnout among Serbs living in enclaves in central Kosovo was higher than in previous elections. An early election had to be called after the LDK pulled out of Mr Thaci's government in October in a row over its then leader, Fatmir Sejdiu, who was also Kosovo's president. After Mr Sejdiu stepped down as president, he was ousted from the LDK leadership by the mayor of Pristina, Isa Mustafa. Another party, the Alliance for the Future of Kosovo, has been weakened because its leader, former rebel Ramush Haradinaj, is being retried by the UN war crimes tribunal in The Hague. Among Kosovo's most daunting challenges are an unemployment rate of 45% - even higher among young people - and one of the weakest economies in Europe. While recognised by many Western countries, Kosovo is still not a member of the UN. Its ethnic Albanian majority are under pressure to show they can build peaceful relations with the Serb minority. Serbs now only number around 120,000 out of Kosovo's population of two million. Most of them live in enclaves guarded by Nato-led peacekeepers, and many are concentrated in the north, between the divided town of Mitrovica and the Serbian border. The US ambassador in Kosovo, Christopher Dell, has warned that an attempt to partition the north could spark renewed ethnic violence across the region, according to a series of secret diplomatic cables released by the Wikileaks website on Thursday.